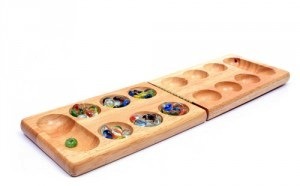 This DVD set from Rock ‘N’ Learn is a fun way to boost math skills for the early grades. Like the Minions, these DVDs have fun characters your little ones will love to get to know! Math facts are easy to learn with fun music and exciting animation. Learn all about counting coins and bills and practice making change. Kids will learn to tell time to the hour, half hour, and minute using traditional analog clocks. Includes Addition & Subtraction Rap DVD, Money & Making Change DVD, and the Telling Time DVD. Fungi is an entirely unique group of living things that most people, including children, are curious about. Most children recognize the most common form of fungi, the toadstool mushroom, because it has been used for generations in children’s literature and designs. There are so many different forms and type of fungi around us, and it is important that kids understand how they fit into the ecosystem around them. Use these prompts and activities to help children learn more about fungi right in their very own backyards. Look around the backyard for different types of fungi, including toadstools, shelves and creeping fungi. Where are you finding fungi? Is there a common place where children notice fungi growing? Steer them towards dead or decaying trees and plants, look near wooden pilings and fencing and then inspect the yard for fungus growing in the soil. Help children snap pictures of create illustrations of the fungus they find. Fungi are entirely unique because they are not considered to be plants or animals, but are an entirely separate classification of living thing. Children might notice right away that fungi share the same traits as living things that are considered plants and living things that are considered animals. When identifying fungi, ask them to observe what they notice about the fungus in question. Where is it growing? How is it feeding itself in order to grow? Point out that some fungus grows in the soil like plants, but they do not need sun to grow like plants do. Talk with children about fungi being a source of food. There are safe and unsafe fungi, so discuss the importance of never eating fungi that they might find. Take children with you to the grocery store to find and purchase some of the safe types of fungi, including yeast, and bring it back home to make a meal with. Fungi are important to the ecosystem, and children might have already discovered their role without realizing it. Discuss where they commonly find fungus and discuss the ways in which fungus feed and break down dead organisms in order to soil and organic material that can feed plants. Fungi are able to grow in so many areas, but to help children learn a little more about the needs and growth of different types of fungi, set up a fungi garden. Because they are quick to develop where dead, organic material is located, help children set up an open compost pile with garden debris that is wet and left alone. Observe the pile for growth every couple of days and see what types of fungi grow. Are animals and insects attracted to the pile and fungi? Ready, set, learn! This short dinosaur unit study gets you up close and personal with the world of dinosaurs. Mix and match the resources provided here to capture your child’s interest and share the basics about these prehistoric animals! Zoom Dinosaurs: Use this online textbook to learn everything from the definition of dinosaur and extinction to dinosaur anatomy and classification. Facts About Dinosaurs: Get the facts about T. rex, Stegosaurus, Triceratops, and more! Debunking Dinosaur Myths: How much do you really know about dinosaurs? Read some commonly spread myths about these prehistoric creatures to get the skinny. BBC Nature–Dinosaurs: Explore various facts about dinosaurs and get news about the latest discoveries. Dinosaurs Big and Small by Kathleen Weidner Zoehfeld: Read about various types of dinosaurs and their sizes. Dinosaurs Before Dark (Magic Tree House, No. 1) by Mary Pope Osborne: This book combines fantasy with facts as Jack and Annie travel back through time to see the dinosaurs. Fossil Cast Project: Make your own fossil at home. Draw T. rex: Learn how scientists figure out what dinosaurs looked like, and then draw T. rex! Make a Paper Mache Dinosaur: Craft your own dinosaur out of paper mache. The Age of the Dinosaurs Begins: Watch this video about early dinosaurs. Dinosaurs 101: Watch this National Geographic video for insight into what we know about dinosaurs and what we still have to learn. Stegosaurus v Allosaurus: What happens when Stegosaurus and Allosaurus square off? Watch this video to find out. Dinosaur Word Search: Practice dinosaur-related vocabulary and word search skills. Dinosaur Flashcards: These printable flashcards provide facts about dinosaurs. Print and learn! Dinosaur Printables: Print a range of dinosaur-themed worksheets. You don’t need a membership to print the samples. Do you have a suggestion on how to make your Dinosaur theme unit fun and active? Share your thoughts in the comments section below! One of my favorite subjects to teach is science. It’s so hands-on, visual and fun-truly one of the subjects that can be taught using almost of your senses! Sometimes, as parent-teachers, we can get overwhelmed with science activities. There’s no need! With just a few, easy to find items (most of these you’ll likely already have in the house!) and a little bit of time, you and your children will be having fun and learning something new quickly! Print off a few sheets of free printable writing paper and start a science journal to record your discoveries! Discover the formula for nutty putty! Mix together all of the above with a spatula. There is no right amount – a little more of one ingredient will simply change the texture of your nutty putty. When you putty is perfect, see how far you can stretch it. If you add more glue, does it stretch more? What happens if you add more Borax? More Water? Note: Nutty Putty is not edible! Watch an egg bounce without breaking! Carefully set the egg in the bottom of the glass. Fill the glass with vinegar and let it sit for at lest 15 hours. Remove the egg and drop it in the sink. The egg’s shell will feel rubbery and won’t break because the acid in the vinegar breaks down the valium carbonate that makes eggshells hard. Did you know water can be used as a magnifying lens? Spread the plastic wrap smoothly over small newspaper print. Using the eyedropper, place several drops of water on the plastic wrap over the print you want to magnify. When seen through the water drops, the letters on the paper look bigger because the drops have a rounded surface that bends or refracts light rays-the sam sway a magnifying glass does. How can you use the sun to tell time? Push one pencil through the center of the paper plate. Stick the pointy end of the pencil into the ground. Make sure that about half of the pencil is shooing above the plate. Using the second pencil, mark the spot on the plate where the shadow of the first pencil falls. Mark the shadow again in an hour. Before mechanical clocks were invented, people used sundials to tell time. The earth always moves around the sun at the same speed, so the shadows also move at the same speed. If you marked every hour on your plate for one full day, you’d create a complete sundial! Make your own music with just glasses and water! Fill each glass to a different height with water. Tap the side of each glass lightly with the spoon. The vibrations move slower in the glasses with more water, so you hear a deeper sound or tone. The vibrations move faster in the glasses with less water, so you hear a higher tone. Now you’re ready to compose your own song! These easy science experiments with everyday objects were inspired by 52 Amazing Science Experiments (52 Series) . This free learning guide for DisneyNature’s Bears comes with so many activities and printables, you can easily turn this into a mini theme unit! Designed for grades 2-6, this 23 page activity book is yours for the taking. Just click the image below! In an epic story of breathtaking scale, Disneynature’s new True Life Adventure “Bears” showcases a year in the life of a bear family as two impressionable young cubs are taught life’s most important lessons. Set against a majestic Alaskan backdrop teeming with life, their journey begins as winter comes to an end and the bears emerge from hibernation to face the bitter cold. The world outside is exciting—but risky—as the cubs’ playful descent down the mountain carries with it a looming threat of avalanches. As the season changes from spring to summer, the brown bears must work hard to find food—ultimately feasting at a plentiful salmon run—while staying safe from rival male bears and predators, including an ever-present wolf. “Bears” captures the fast-moving action and suspense of life in one of the planet’s last great wildernesses—Alaska! Directed by Alastair Fothergill (“Earth,” “African Cats” and “Chimpanzee”) and Keith Scholey (“African Cats”), and narrated by John C. Reilly, “Bears” arrives in theaters April 18, 2014, to celebrate Earth Day. For more information about Disneynature, like them on Facebook: facebook.com/Disneynature and follow them on Twitter: twitter.com/Disneynature. Description (from Amazon): “There has obviously been some kind of mistake,” writes Alexander T. Wolf from the pig penitentiary where he’s doing time for his alleged crimes of 10 years ago. Here is the “real” story of the three little pigs whose houses are huffed and puffed to smithereens… from the wolf’s perspective. This poor, much maligned wolf has gotten a bad rap. He just happened to be in the wrong place at the wrong time, with a sneezy cold, innocently trying to borrow a cup of sugar to make his granny a cake. Is it his fault those ham dinners–rather, pigs–build such flimsy homes? Sheesh. This 10th-anniversary edition of Jon Scieszka’s New York Times Best Book of the Year, The True Story of the 3 Little Pigs!, includes a special, impassioned letter from prisoner A. Wolf himself and a snappy new jacket by Caldecott Honor artist Lane Smith, whose quirky perspectives still color the illustrations throughout. As with The Stinky Cheese Man and Other Fairly Stupid Tales, the collaborators take a classic story and send it through the wisecracker machine, much to the glee of kids young and old. (Ages 4 to 8 or much, much older) –Emilie Coulter –This text refers to an out of print or unavailable edition of this title. You may think you know the story of the Three Little Pigs and the Big Bad Wolf, but this story will make you think otherwise. As told by A. Wolf, this is a delight for all ages. Before reading the story, ask your student(s) if he or she remembers the story of the Three Little Pigs and have them tell it to you. Have a discussion about point of view; talk about how the original story is written from the pigs’ point of view and this one is written from the wolf’s point of view. After comparing the elements of the two versions, ask your child(ren) what conclusions can they come to about which parts were true? Can you remember a time where two different people had a different view of what happened? In this story, the wolf eats a lot (and he’s baking a cake!). Talk about what a wolf in the wild really eats (you can find out here). In this story, A. Wolf was trying to make a cake for his grandmother. Try this easy recipe and make your own cake. Can you really build a house from straw? Watch this video to find out! Create your own version of the story and act it out with friends & family. Watch the video below for ideas! St. Patrick’s Day began as a holiday to remember the life of a man named St. Patrick who did good work in Ireland in the late 5th Century. But over the years, St. Patrick’s Day has become more of a day to simply celebrate being Irish. 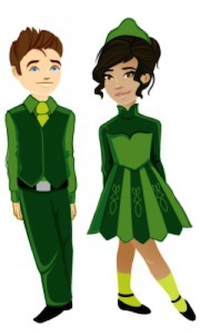 Traditional symbols of the holiday are shamrocks, Leprechauns, and of course, wearing the color green! And, before we move on, how cute are the Little Passports characters, Sam and Sofia? Across the world, people who want to celebrate head to parades and events whether they’re really “Irish” or not. Little Passports (A monthly children’s subscription service that teaches your kids about different states in the USA and new countries around the world) has shared some of the special festivities planned in each of these countries. 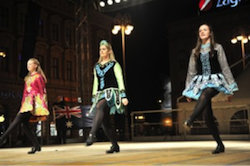 In Brisbane, the St. Patrick’s Day celebrations spread over ten days and include not only a parade, Irish dancing, dinners, and boxing matches, but also a Family Sports Day which includes Gaelic Football and other Gaelic sports! 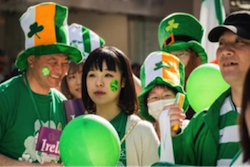 In Tokyo, over 1,000 people wearing green will take part in their parade this year. They also host an International Collegiate Festival with workshops where you can learn Irish dance, play Irish music, and enjoy a full day of concerts! Dublin hosts a giant four day festival featuring a parade with marching bands from all over the world. They also hold a fair with carousels, roller coasters and Ferris wheels and an Enchanted Banquet which includes a “curious evening” with plenty of erish fables, fairy tales and folklore. 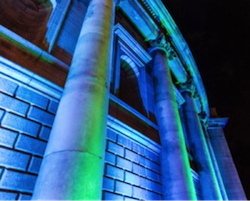 The festivities begin with famous buildings like the Blarney Castle, St. Patrick’s Cathedral, and the Bank of Ireland being lit green! The United States hosts St. Patrick’s Day parades in over 100 cities. 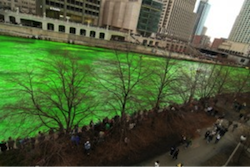 One of the biggest is in the city of Chicago, who famously dyes its river green for the day! After the huge parade which draws thousands of people, you can head to the St. Patrick’s Day Festival at the Irish American Heritage Center and listen to Irish music, dance, and of course eat good old Irish food and drinks! St. Patrick’s Day is only a few days away! Sam and Sofia are trying to decide where around the world to celebrate. Will you help them decide where to go? Visit their Facebookpage to vote. 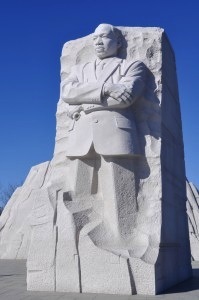 February is Black History Month, an opportunity to talk with children about race and civil rights, as well as the heritage, accomplishments, and culture of African Americans. Join Little Passports’ Sam and Sofia as they explore these 3 ways to celebrate and learn! Description (from Amazon): Annie and her dog, Oscar, have had a busy day playing in the snow. Somehow Annie’s red mitten has disappeared in all the fun. They look high and low. . . . It’s not on the sledding hill, and it’s not by the snow castles. Maybe an eagle carried it off to keep its baby’s head warm. Or maybe a mouse is using it as a sleeping bag. When the sun goes down, Annie and Oscar have to give up their search and go inside. But when Annie looks out the window, something red catches her eye. . . .
With entirely new full-color illustrations, this beautiful version of the beloved picture book The Mystery of the Missing Red Mitten retains all the charm of the original. This lesson is a wonderful compliment to our free Winter Theme Unit study. Children will learn about the characteristics of a mystery, learn observation skills and discuss a time when she or he lost something. Ask your child if she or he knows what a mystery is. Before you read the text on each page, point out the pictures and ask your child what is happening. Ask your child to remember a time when he or she lost something. How did s/he feel? How did s/he find it? This story is full of imagination (an Eagle soaring off with the mitten, a mouse using it for a sleeping bag). Encourage your child to think of creative ways the mitten might be used. In the story, Annie had to re-trace her steps to try to find her mitten. See if you can find your way through the mitten maze. Play a game of “hide the mitten” at home, using your own mittens. Make it even more challenging by using more than one pair of mittens! Ask your child what could be done with only one mitten. Print this template and write about it. Make your own mittens from an old sweater (instructions below). If your child is too young to use a real needle & thread, make a mitten lacing card by printing this template onto card stock and punching holes around the edges.